Bumble Domicile weaves observation of an on-site bumble bee hive containing live video and audio of its internal activity with the hive’s pollen-collecting activity, and, real-time ultraviolet video of flowering plants in the building’s communal garden adjacent to the gallery. Bombus Bumble bee colonies in nature often live underground in hollows such as discarded mouse nests. Their colonies grow throughout the summer months and naturally die off by the first frost. The mated new queens then find different underground locations in which to over-winter to start a new colony cycle the following Spring. 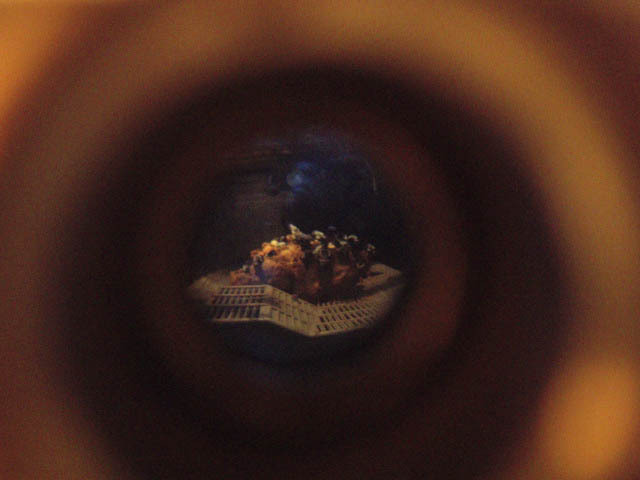 The above video starts the gallery peephole and then moves to where the bees hang out, finally we see the view out their front door. Our hive was not reared from wild, locally-caught bumblebees, but was a commercially-started Bombus hive. 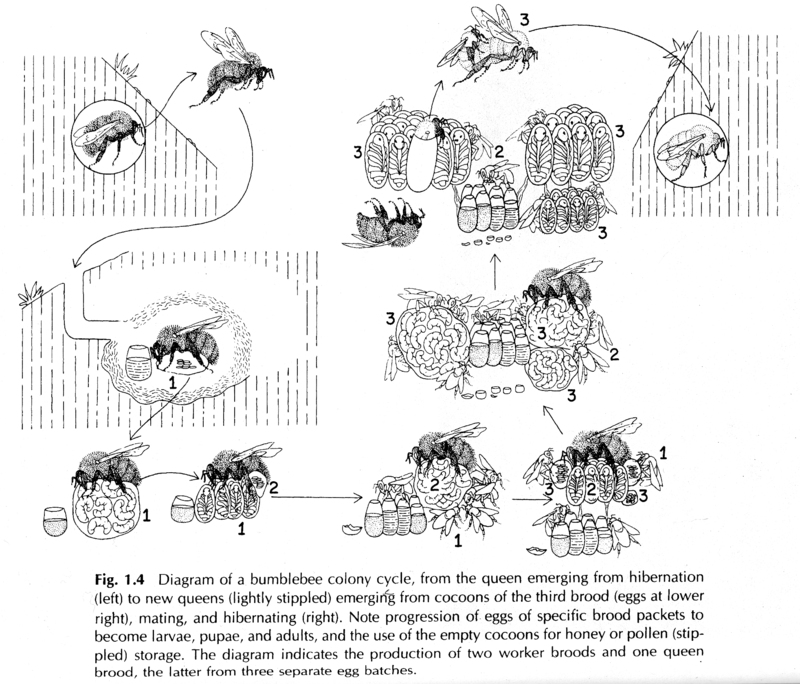 Although its queen was descended from local Ontario B. impatiens, she and her colony possesed a few significant differences from wild B. impatiens colonies – differences which caused us to carefully weigh our choices between using a commercially raised hive vs. one reared from a locally caught wild bumble bee queen. We learned some somber lessons in the end. 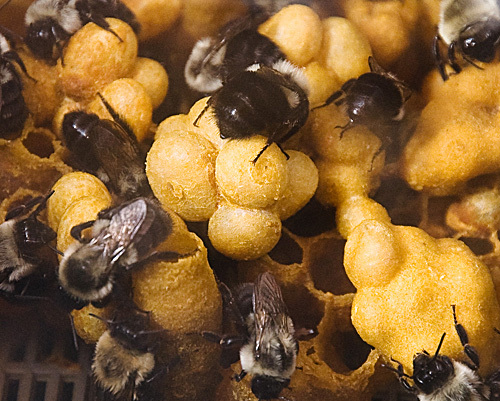 Sarah Peebles (project lead) wrote more about art and ethics, what the fate of our bumble bee colony was, why she would not use a commercial bumble bee hive in the future, and why she and strongly recommends that others interested in using Bombus observation hives for art or education raise their own local wild colony rather than purchase a commercial hive. Leading bee biologists also weighed in about controversy that surrounds commercially raised bumble bee colonies and the latest science. 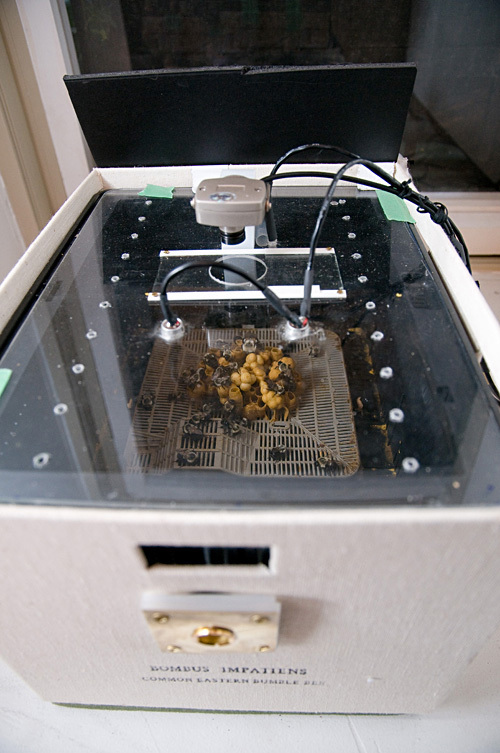 A cautionary note: Please do not move your bees and wasps to new localities, or sell or give away dirty equipment (i.e., used equipment which may have been infested by parasites). The idea is for people to grow and nurture their *local* beneficial insects. Long distance commerce and problems with hygiene are blamed for many problems (of honey bees, and in some regions of commercial bumble bees, for example), and this concern extends to wild bumble bee populations (in the U.S.A. and Canada, including Ontario) as well as to solitary bees. This topic is also addressed at The Xerces Society. See Introduction to Bees for thoughts on pollinators, plants and co-evolution by Richard C. Brusca, Executive Program Director, Arizona-Sonora Desert Museum and a general introduction to bees by Sarah Peebles.